It’s well known that here at Life Goggles, Method products are a favourite. They work brilliantly and are great for the environment. But when Big Green Smile sent me Method’s Daily Shower Spray to test I wondered not whether it worked but whether it was better than just cleaning the shower normally. And the truth is that I’m not too sure. What I do know is that it works great. As usual. It contains all natural ingredients so I actually enjoy using it, no need for rubber gloves or worrying about the smell. In fact although it’s ylang ylang ‘flavour’, it doesn’t actually smell of much. But it works pretty well. As it says on the back, it’s best to start with a clean shower and use this as a way of keeping the shower nice and clean. If the shower is already dirty, then this isn’t the strongest cleaner there is and you’ll need something like Method’s tub and tile cleaner first. 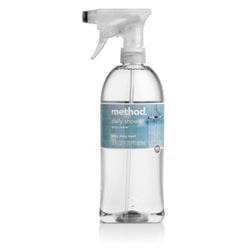 Method Daily Shower Spray is available from Big Green Smile for £3.00 for an 828ml bottle.